The first details for Blackroom – the new FPS from Doom creators John Romero and Adrian Carmack – have been revealed, landing alongside the launch of the game’s Kickstarter campaign. Could Romero do it again and deliver one of the best FPS games of all time? Romero and Carmack are sticking to what they know and creating an FPS with a focus on speed, circle-strafing, rocket-jumping and skill, all backed by a heavy metal soundtrack. It’ll be classic Romero, basically – the twisting level design, secret rooms, ultra-violence – but with the graphical oomph of any Unreal 4 engine game. Indeed, Romero has said he’ll be designing every level personally, despite it being a team of around 20 people. Though it all sounds what you’d expect, the duo won’t be returning to the satanic themes of their previous games, Doom and Quake. This is set in a future where people can experience simulations indistinguishable from real life in a Holodeck-style environment called the Blackroom, but the technology has gone bad, with anomalies appearing and realities blending together. As an engineer trying to fix these anomalies, you’ll be able to harness the power of the Boxel, manipulating the pixels with a bunch of special abilities. This is all a great excuse for hopping between varied shooty playgrounds, with ruined Victorian mansions, wild west ghost towns and swashbuckling pirate galleons already promised, and with full modding support teasing the possibility of more community ideas bolstering the 10+ hour single-player campaign. Romero and Carmack aim to bring this variety to the game’s multiplayer too, promising hellish infernos, military sim and interstellar space for the co-op, 1v1 deathmatches and free-for-all arenas of the multiplayer. 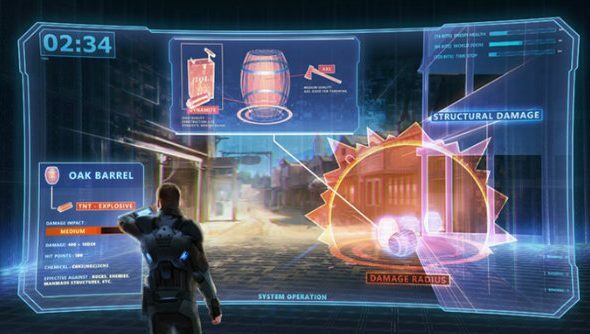 At the time of writing, Blackroom has raised $28,000 of its $700,000 Kickstarter goal. Blackroom is planned to release on PC in Winter 2018.